"Oh, Mr. President. Do not let so great an achievement suffer from any taint of legality," was the advice that Philander Knox, Theodore Roosevelt's attorney general, gave him when Roosevelt wondered whether congressional approval was necessary to legitimate the revolution he fomented in Panama to acquire land to build the Panama Canal. "Little Phil," as Roosevelt called Knox, was more than a wit: He was one of the leaders of the national Republican Party and an important molder of its foreign policy between 1900 and his death in 1921. The son of a local banker, Knox (1853-1921) was born in Brownsville, a small town on the National Road in Fayette County. After graduating from Mount Union College in Stark County, Ohio, Knox earned his law degree and by the 1890s had emerged as one of the nation's ablest and most powerful corporate lawyers, largely through his connections with the Carnegie steel empire. 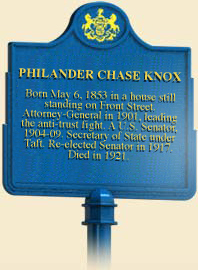 It was Knox who defended Henry Clay Frick against a lawsuit from steelworkers beaten up by Pinkerton agents during the Homestead Strike of 1892, and who then defended Andrew Carnegie when he was accused of defrauding the U.S. Navy by providing inferior armor plate, and then again when he was accused of receiving illegal kickbacks from the Pennsylvania Railroad. Knox then turned down newly elected President William McKinley's offer to become United States' Attorney General. Instead, he helped engineer the creation of U.S. Steel, the world's largest corporation. Shortly before McKinley was assassinated in 1901, Knox accepted the president's offer to become the United States Attorney General, and began a long and successful career in government. "The Senatorial Hall of Fame, Pennsylvania Knox and Penrose," circa 1920. Continued in office by McKinley's successor Theodore Roosevelt, Knox prosecuted the critical Northern Securities Company Case, the first major successful anti-trust case undertaken by the federal government under the Sherman Anti-Trust Act of 1890. 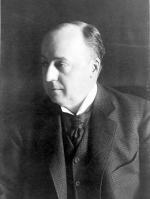 Knox agreed with President Roosevelt that the company, under the direction of James Hill and J.P. Morgan (with whom Roosevelt worked well on other occasions, including mediating the Anthracite Coal Strike of 1902 in favor of the miners), had monopolized the major railroad lines in the American Northwest. At first it might appear odd that Philander Knox, a former U.S. Steel lawyer and champion of big business, should support government intervention in the American free-market system. 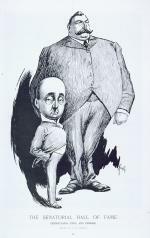 But in the early 1900s, a growing number of business and political leaders, including Roosevelt, President William Howard Taft, J.P. Morgan, and the Mellon Bank interests in Pittsburgh, were embracing the belief that it was in big businesses' interests for government to curb corporate excesses. They had nothing against huge concentrations of wealth, but insisted that they remain free of scandal, and thereby defuse much of the discontent that muckrakers such as Ida Tarbell and Lincoln Steffens directed against the most egregious offenders, including Standard Oil and the Philadelphia and Pittsburgh urban political machines. Philander Chase Knox, by Arthur de Ferroris, 1905. Upon the death of United States Senator Matthew Quay in 1904, Pennsylvania Governor Samuel Pennypacker (Quay's cousin, whose election the late senator had arranged) appointed Knox to fill his seat. Elected to a full term in 1905, the able Knox quickly became the Senate leader - a position that Pennsylvania's other senator, Boies Penrose, now the leader of the state Republican machine - did not yet covet. Roosevelt offered Knox a Supreme Court justiceship, which he declined. Instead, Knox ran unsuccessfully for the Republican nomination for president in 1908. 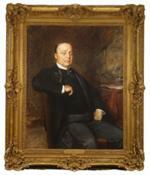 The man who defeated him, William Howard Taft, then selected Knox as his secretary of state. In this position, which he held from 1909-1913, Knox became an indefatigable promoter of American business overseas. It was Knox who formulated the Taft administration policy of "dollar diplomacy," designed to replace Roosevelt's "big stick" of military intervention in Latin American countries, with American investment in the region. In theory, this would help the economies of these poor nations and lessen the need for armed force. In reality, the flag often followed the dollar overseas. In 1912, Knox persuaded Taft to send troops to Nicaragua, where they remained for twenty-one years, to preserve a pro-United States government. In the years and decades that followed, the United States would repeatedly send its troops to Latin American countries to protect American business interests. In 1912, Knox again turned down a seat on the Supreme Court, then left office when newly elected president Woodrow Wilson, a Democrat, in 1913 replaced him with William Jennings Bryan. Returning to the Senate in 1916, Knox became, with Henry Cabot Lodge of Massachusetts, the leading Republican opponent of the Versailles peace treaty Wilson negotiated to end World War I, and of the United States' proposed membership in the League of Nations. Along with most Republicans, he believed the League's constitution obliged the United States to go to war at the request of the League rather than with the approval of Congress. In 1920, Knox received consideration as the Republican candidate for president, but was passed over for Ohio Senator Warren G. Harding. Like Pennsylvania Senator Boies Penrose, Knox died in 1921. Both men, prominent conservatives and champions of big business, had exerted a significant influence on American politics and foreign policy. Herbert F. Wright, "Philander Chase Knox, Secretary of State," in The American Secretaries of State and Their Diplomacy, vol. 9, ed. Samuel F. Bemis (New York: Pageant Books, 1929). Walter Scholes, "Philander C. Knox," in An Uncertain Tradition: American Secretaries of State in the Twentieth Century, ed. Norman Graebner (New York: McGraw Hill, 1961).